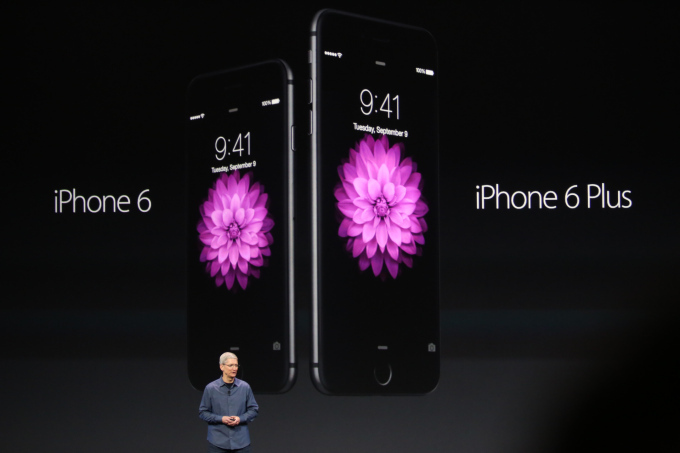 As expected, Apple has unveiled a larger iPhone, and it’s called the iPhone 6 Plus. It also happens to be the biggest iPhone to date. The iPhone 6 Plus features a new Retina HD display technology; according to Apple’s Phil Schiller, the iPhone 6 Plus and iPhone 6 screens are new in every way. The iPhone 6 Plus measures 5.5 inches, just as was rumored. Its display has a resolution of 1920×1080 with 401ppi. The iPhone 6 Plus also managed to pack two million pixels in its display, over a million more than the iPhone 6. With a larger screen comes new landscape view, which basically means a horizontal orientation so users can see what’s on their screen in a sideways stroke. While the iPhone 6 Plus is larger than any iPhone before, it’s also razor thing, measuring only 7.1mm thick. And what’s making this new larger iPhone tick? Apple’s latest A8 processor, a 64-bit chip tallying two billion transistors. The iPhoen 6 Plus’ GPU can perform up to 50 times faster than previous generations, while the CPU is up to 25% speedier, Apple claimed. Apple’s M motion coproccesor also got an update, and it’s now called the M8. The sensor can measure a how many stairs a user has climbed, Schiller said, a nod to the iPhone 6 Plus’ health-metric measuring capabilities. The M8 constantly gathers motion data from an accelerometer, gyroscope and compass. On the battery front, Apple has gone out of its way to make the iPhone 6 Plus’ battery better than the iPhone 5S in every way (audio, video, Wi-Fi browsing, etc.). Jumping to its connectivity, the iPhone 6 Plus will feature VoLTE support. It supports over 200 LTE bands and will allow for Wi-Fi calling. T-Mobile and EE have both signed up to support Wi-Fi calling. The iPhone 6 Plus rear iSight camera measures 8MP. It’s an entirely new sensor and features a new Autofocus with Focus Pixels feature. The handset’s Autofocus is two times faster than before and it has an aperture of f/2.2. While the camera specs between the iPhone 6 and iPhone 6 Plus are identical, the 6 Plus does stand out in that it has optical image stabilization. The iPhone 6 camera doesn’t. As for recording capabilities, the iPhone 6 Plus camera can record 1080p video at 60fps and 240fps in slow motion. Moving to the front, the iPhone 6 Plus features a new 1.2MP HDR FaceTime camera. FaceTime, by the way, now features a burst mode. A nice little touch is moving the sleep/wake button from the top to the side, making the device a little more mandible friendly. Like the iPhone 5S before it, the iPhone 6 Plus comes stamped with Touch ID. Along with the iPhone 6, the iPhone 6 Plus will ship with Apple’s new mobile payment system, Apple Pay. As for the thing you likely care most about, the iPhone 6 Plus price starts at $299/£619 for 16GB. A 64GB iPhone 6 Plus will run you $399/£699 and the 128GB version will cost $499/£789. Notice there’s no 32GB version? That’s because there isn’t one. The iPhone 6 Plus release date is slated for September 19 and users can pre-order it beginning September 12. The new iPhone comes in a choice of silver, gold and space gray.